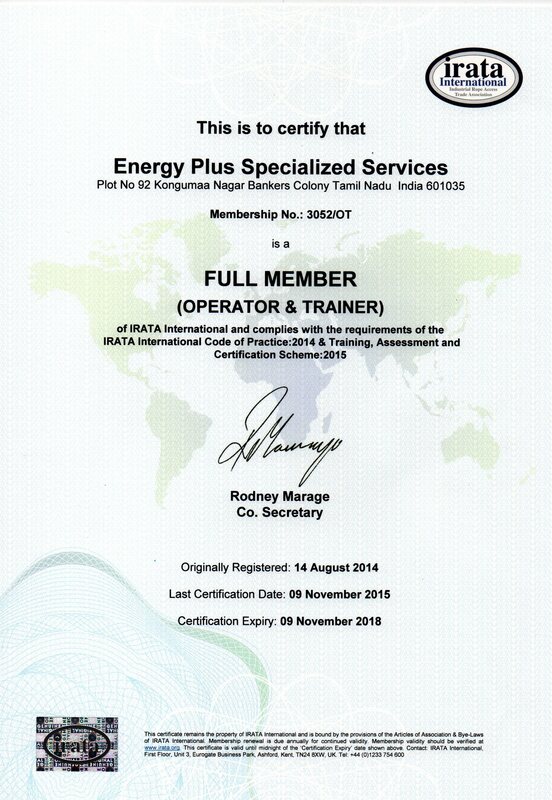 ENERGY PLUS SPECIALIZED SERVICES is the leading Specialized Service provider in Working at Height, Multi-faceted Inspection, Maintenance, Construction, Repair, Facilities Management and Training by Rope Access & Ground Access around the world, providing expertise and innovative solutions to the Oil & Gas, Petrochemical, Offshore Drilling, Marine, Power, Wind Energy and Civil Industries. A dynamic and innovative business, operated by Experienced Multi-tasking professionals in Site, Project & Resource management bringing in specialized training. With a proactive attitude, we make a great effort to offer added value to our clients – we align ourselves with our clientsâ€™ needs. 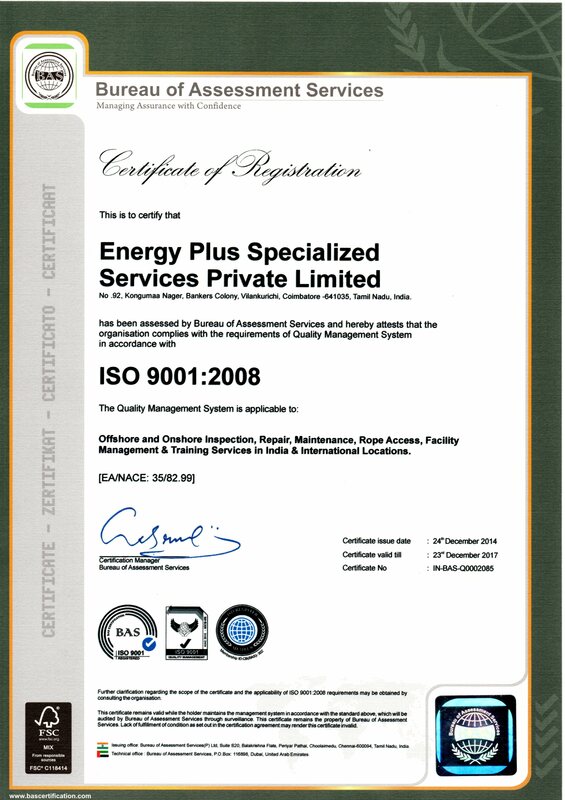 The Top Management and whole team is fully committed to attain full Customer’s satisfaction by exceeding the Safety and Quality compliance norms. We offers a wide range of seamless solutions and specialist services across all areas of Asset Integrity Management and Maintenance, while always seeking to deliver projects safely, cost efficiently, reducing risk and improving environmental performance. 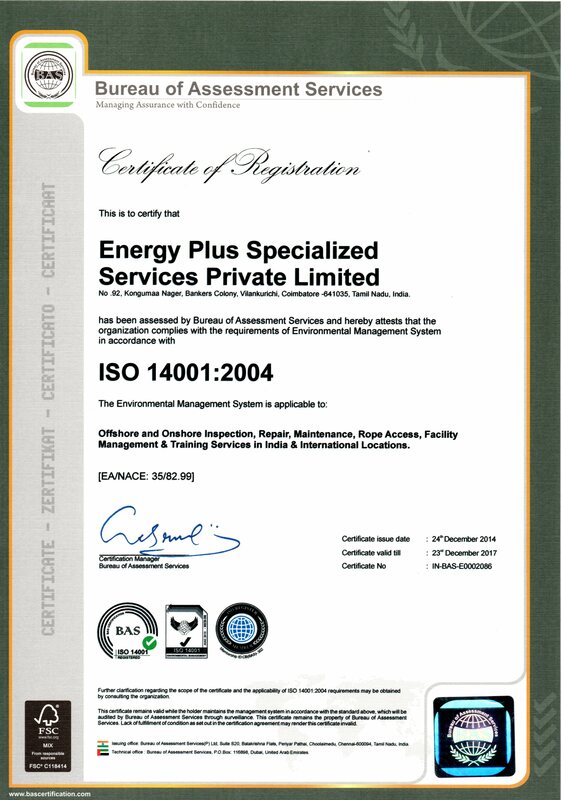 ENERGY PLUS shall be a professionally managed company devoted to achieve Total Customer Satisfaction and improve stake holder value. We shall be an innovative, entrepreneurial & empowered team consistently generating value and achieving global benchmarks. We shall exhibit a culture of Safety, Quality, Caring and Trust while meeting the expectation of employees, stakeholders, suppliers, society & environment. 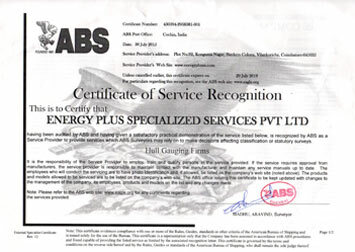 ENERGY PLUS shall be renowned and unique worldwide specialized solutions provider in Inspection, Maintenance, Construction, Repair, Facilities Management & Training Service provider to Oil & Gas, Petrochemical, Offshore Drilling, Marine, Energy and Civil Industries, while excelling ourselves in highest standards of Safety, Quality and Customer satisfaction. 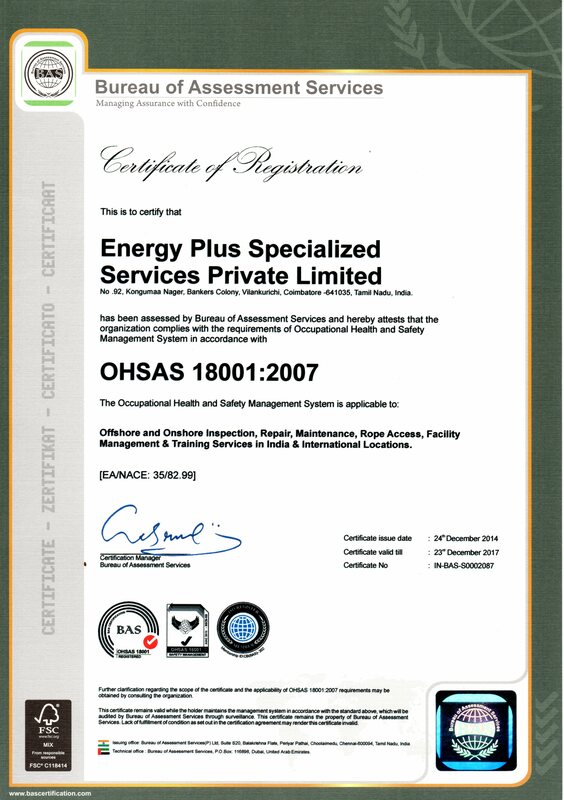 ENERGY PLUS is committed to Quality Health Safety and Environmental (QHSE) excellence. We recognize that best QHSE performance is essential to our business success and that QHSE is vital to our business activities. We demonstrate through high international standards and accreditation. Our Safety culture and Quality workmanship and close working relationship with our clients ensure our reputation is the best in industry. Our goal is to achieve a high level of customer satisfaction by providing quality services on time at all times. Our long-term business success depends on our ability to continually improve the quality of our services while protecting people and the environment. Protecting our environment and that of the communities where we work and live. Improving the quality of our services and product s delivery. 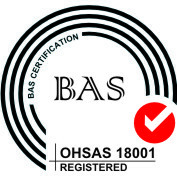 Comply with established procedures, Quality, Safety & Environmental standards and applicable regulations.